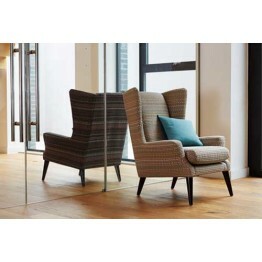 The Parker Knoll Sophie chair which has slayed legs and wings. Made in all the Parker Knoll fabrics and three wood shades which can be made and delivered to you within around 8 weeks. This piece of furniture has a classic heritage look inspired by the 1950s designs and is very comfortable too. The Parker Knoll Sophie chair is beautifully styled and will add a touch of class to any home. ..